Owing to the lack of pioneering innovation and stalled funding, more than 90 percent startups in India fail in the first five years, a study by software major IBM revealed on Wednesday. The startups in the country are facing funding roadblocks both at entry and exit stages while successful global startup ecosystems are well supported by active investor communities. "We believe that startups need to focus on societal problems like healthcare, sanitation, education, transportation, alternate energy management and others, which would help deal with the issues that India and the world face," said Nipun Mehrotra, Chief Digital Officer, IBM India/South Asia, in a statement. More than 76 percent of Indian executives pointed to the country's economic openness as a major business advantage, while 60 percent identified skilled workforce and 57 percent of the executives said that a large domestic market provides significant advantages. Seventy three percent of Indian business leaders surveyed believe that ecosystems can help accelerate innovation and almost 80 percent of the executives from established companies say collaboration with startups accelerates new ideas. Seventy percent of the venture capitalists believe that talent acquisition is one of the biggest challenges faced by Indian startups, and limited availability of necessary skills impedes growth. 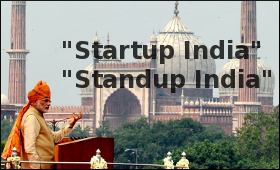 "Stakeholders' (established businesses, startups, VCs, Government, higher education) involvement and contribution is key to creating a conducive environment for the success of the startup economy," the study noted. The IBM study titled "Entrepreneurial India" was based on interviews with more than 1,300 Indian executives, including 600 startup entrepreneurs, 100 venture capitalists, 100 government leaders, 500 leaders of established companies and 22 educational institution leaders.